Join Us!!! We are looking for someone to help us cover Gabonese basketball. Please send us an e-mail. SIG Strasbourg (Jeep ELITE) added to their roster experienced 36-year old Gabonese ex-international power forward Stephane Lasme (203-98kg-82, college: Massachusetts). He played recently at Panathinaikos in Greek A1 league, but left the team last month. In 11 games he had 6.8ppg, 4.5rpg and 1.6bpg this season. Lasme also played 18 games in Euroleague where he recorded 5.1ppg and 2.8rpg. The last season he played at Unics Kazan in Russian league. In 19 Eurocup games he averaged 14.6ppg, 6.4rpg and 2.5bpg. Lasme helped them to make it to the quarterfinals. He also played 28 games in VTB United League where he got 12.6ppg, 6.0rpg, 1.1apg and 1.6bpg. Lasme contributed to his team ending the regular season as at the second position in the league and they also made it to the VTB United League Final Four. A very spectacular season in his career as he was named to VTB United League All-Star Game. In 2007 he was drafted by Jackson Wildcats (USBL) in third round (22nd overall). Lasme attended University of Massachusetts and it is his twelfth (!!!) season in pro basketball. The list of the past achievements is quite long as among others Lasme's team won Turkish Cup in 2015. He was also voted Eurobasket.com All-EuroCup Defensive Player of the Year back in 2016. Lasme represented Gabon at the Afrobasket Championships in Rades (Tunisia) four years ago. His stats at that event were 6 games: 11.2ppg, 6.8rpg, 2.0spg, Blocks-3 (1.8bpg), FGP: 52.1%, 3PT: 9.1%, FT: 77.8%. Lasme is quite experienced player. He has played also professionally in Israel, Serbia, Spain (Blusens Monbus), NBA (Boston Celtics and Golden State Warriors), Turkey (Anadolu Efes and Galatasaray), Russia (Spartak Sankt Petersburg) and NBA G League (Texas Legends and Maine Red Claws). Lasme is close to retirement age as a player. It's very possible he may end his playing career at Strasbourg. Extremely mobile and athletic player. Runs the court like a guard and shows rare lateral quickness for a player his size. Fluent shot blocker capable of dominating the lane. Excellent out of position rebounder. Plays the game with raw aggression and passion. Underrated post passer who has little problems identifying open players. Experienced 36-year old Gabonese power forward Stephane Lasme (203-98kg-82, college: Massachusetts) left Panathinaikos Superfoods Athens (A1). In 11 games he recorded 6.8ppg, 4.5rpg and 1.6bpg this season. He also played 18 games in Euroleague where he averaged 5.1ppg and 2.8rpg. The last season Lasme played at Unics Kazan in Russian league. In 19 Eurocup games he had 14.6ppg, 6.4rpg and 2.5bpg. He helped them to make it to the quarterfinals. Lasme also played 28 games in VTB United League where he got 12.6ppg, 6.0rpg, 1.1apg and 1.6bpg. He contributed to his team ending the regular season as at the second position in the league and they also made it to the VTB United League Final Four. Great season indeed as he was voted to VTB United League All-Star Game. In 2007 Lasme was drafted by Jackson Wildcats (USBL) in third round (22nd overall). He attended University of Massachusetts and it is his twelfth (!!!) season in pro basketball. Lasme has tried to make it to the NBA and played in the NBA Pro Summer League in 2016. The list of the past achievements is quite long as among others his team won Turkish Cup in 2015. Lasme received also Eurobasket.com All-EuroCup Defensive Player of the Year award back in 2016. He represented Gabon at the Afrobasket Championships in Rades (Tunisia) four years ago. His stats at that event were 6 games: 11.2ppg, 6.8rpg, 2.0spg, Blocks-3 (1.8bpg), FGP: 52.1%, 3PT: 9.1%, FT: 77.8%. 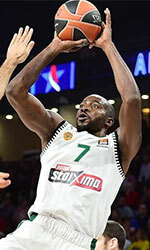 Panathinaikos Superfoods Athens (A1) agreed terms with experienced 35-year old Gabonese forward Stephane Lasme (203-98kg-82, college: Massachusetts). It is actually his comeback to Athens as he has played here before. Lasme played last season at Unics in Russian VTB league. In 19 Eurocup games he had 14.6ppg, 6.4rpg and 2.5bpg. He helped them to make it to the quarterfinals. Lasme also played 28 games in VTB United League where he recorded 12.6ppg, 6.0rpg, 1.1apg and 1.6bpg. He contributed to his team ending the regular season as at the second position in the league and they also made it to the VTB United League Final Four. A very impressive season as he was named to VTB United League All-Star Game. The previous (16-17) season Lasme played at Texas Legends in U.S. League. In 19 games he averaged 11.8ppg, 7.0rpg, 1.1apg, 1.0spg and 3.3bpg. The former University of Massachusetts staris in his twelfth (!!!) season in pro basketball. The list of the past achievements is quite long as among others he won Greek League championship title in 2014. Lasme was also voted Eurobasket.com All-EuroCup Defensive Player of the Year in 2016. He represented Gabon at the Afrobasket Championships in Rades (Tunisia) three years ago. His stats at that event were 6 games: 11.2ppg, 6.8rpg, 2.0spg, Blocks-3 (1.8bpg), FGP: 52.1%, 3PT: 9.1%, FT: 77.8%. Lasme is quite experienced player. He has played also professionally in Israel (Maccabi Fox Tel-Aviv), Serbia (Partizan), Spain (Blusens Monbus), Turkey (Anadolu Efes and Galatasaray), NBA (Boston Celtics and Golden State Warriors) and NBA G League (Maine Red Claws). It's very possible he may end his playing career at Panathinaikos.